In the late 40’s through the 50’s the EJ&E relied on the 2000 HP Baldwin center-cab transfer locomotives as the mainstay of the locomotive fleet. With six axles, six traction motors, and two 1000HP diesel engines, these 75 ft long DT 6-6-2000 units had vanquished the last of the 2-8-2 Mikados in 1948. As a modeler of the EJ&E in 1957 I needed to have a center-cab in my fleet. Choosing which of them to model was easy. I have a picture of my grandfather in the cab of #119. There were three options to choose from – Overland’s brass model, kit-bash, or scratch building. The brass option was too expensive, scratch building was beyond my current skills, which left a kit-bash. This project had been done before and a very thorough article published by Robert Bochenek in “Railroad Model Craftsman” June 1995. Stewart makes most of the needed parts, they just happen to be stuck in the middle of a different model. Stewart’s AS616 model is the key to the project as that model provides the material for the two long hoods, and the truck side frames. Trucks and power-train were provided by a Stewart Alco Century C628. Both the AS616 and the Alco C628 share the same asymmetric trucks – the axle spacings are not the same for all three axles. Unfortunately, the trucks on the center-cab have an axle arrangement the reverse of the AS616/C628. However,the frame length and bolster spacing is within four scale feet of the correct value. This is going to be an operational model, not a contest queen – it will look like a DT 6-6-2000. I started this project three years ago and the first step was to get the parts. An order to Bowser/Stewart provided two AS616 shells, side frames and brake parts. I found an Alco C628 on eBay to provide the frame and power-train, and purchased a Tsunami Baldwin sound decoder. Four small Knowles speakers would finish out the sound installation. Part of the documents I have from my grandfather is an operators manual from the DT 6-6-2000 so I had dimensioned drawings to work from. If I could not get the hood configured then the project was a wash, so I started by dropping the cab (to short) and the short hood (not needed) into the scrap box. Then the two long hoods got cut into five pieces and two from each hood were discarded. This step got the radiator to the proper length, removed the fourth top access panel, and removed an extra set of side doors. AS616 hoods, the rear one is the original, and the front one has been cut. The two small sections get discarded. After truing up the cuts the hood was carefully glued together. A bit of red Bondo patched up a couple of slips with the saw. The two new long hoods were carefully measured, trimmed, and joined to create the 69‘ long hood structure for the center-cab. Two AS616 decks were also cut so that they could be joined together as the new deck. A strip of styrene was added to the bottom of the hood to serve as the visible frame which extends from the deck to the bottom of the doors. Fit together they begin to look like part of a center-cab, minus the cab. Beginning to look like a center-cab. An EJ&E series 500 DRS 6-6-1500 (AS616) sits behind. Two AS616 shells were used for the center-cab and the photo shows the modifications. Constructing the cab was a challenge but it broke down into several steps that were done in stages. The EJ&E units had aprons on the sides below and toward both ends from the cab, with stylish curves. See the photo at the top of the post. Step one was to develop the drawings and cut the cab sides from 0.020″ styrene. The side-wall height was left a couple of millimeters high at this point. Step two was to cut the cab front and back parts to fit the hood, the deck, and the roof curvature. These components were then taped in place on the hood, deck, and chassis to check the fit and to mark the chassis for trimming the extra material from the fuel tank area. An over-sized piece of 0.020″ styrene was taped to a curved form, carefully heated and allowed to cool on the curved form for the roof. There was some warpage around the edge and the extra material was cut away. Windows were cut, doors scribed, corner braces of strip styrene glued in place and the cab was assembled with care to be sure it was square. Index guides were glued to the hood sides and top to provide a firm base to lock the cab in position. When the fit of the cab and walkway was correct it was secured to the deck with #80 screws into tapped styrene blocks under the cab walkways. Modifications to the frame included cutting away metal from the fuel tank area to fit a square fuel tank constructed of styrene, building and fitting two transverse air tanks, filters, and piping, and fitting four very visible large drain lines for engine and air compressor oil. Other than adding a set of wipers to the third axle which improves the power reliability on these Stewart chassis, no modifications were done to the trucks except to replace the C628 side-frames with the Baldwin AS616 side-frames. Decoder installed, fuel tank area modified, with transverse air tanks, filter,and piping. Stanchions from Smokey Valley – an Alco RS2 set – were used for the side hand rails which were formed from 0.0125″ phosphor bronze wire. The end handrails were custom built from very small brass strips, phosphor-bronze wire, and solder using a jig. All of the old handrail holes were filled, holes in the pilot filled, and new holes drilled to fit the smaller rails. Wire cut levers were installed with small lift rings as pivots. Since these units were not MU’ed until after they were re-built in ’58, only a train line was installed on the pilots. Research on the EJ&E Yahoo list led to a photo of #119 in 1957 showing a simple orange hood and cab with black frame, apron, and trucks. The model was primed with MOW grey Scalecoat 2 paint, and then given two coats of a mix of Reefer Orange and Daylight Orange for the hood areas, and Engine Black lightened with a bit of MOW grey for the deck, pilots, tank, frame and trucks. Green cab lettering and numbers were applied from a set of Microscale EJ&E diesel decals, using the older Roman style letters. Dull-coat and a light black wash were applied followed by another coat of dull-coat. Installation of the electronics was easy given the space inside the shell. An enclosure was built at each end to hold two Knowles flat speakers. LED lights were installed and the Tsunami Baldwin decoder installed on top of the motor. With four speakers the volume needs to be set fairly low to be tolerable, but the sound quality is excellent. I am experimenting with some heavy reverb on the exhaust to give an effect of dual prime movers. Operation of the locomotive is smooth and darned if it does not look and sound like it’s prototype . The deck sits about 2mm higher than it should due to a mis-match between the C628 frame and AS616 decks so the crew has a big first step to climb up. I may mill a new frame next year to correct that or modify the existing frame, but for now I am going to enjoy operating it, watching and listening as it burbles down the tracks. The center cab model rolling past a mockup of Griffith Tower – a future project. My Grandfather started with the EJ&E in 1917 as a yard clerk and became a fireman in 1919. After 20 years, he was promoted to engineer in 1939 and retired in 1961. Every day since he became an engineer he kept a log book, recording the date, time on and off duty, train number, what engine he was operating, what station he went on and off duty at, and the crew that was working with him in the cab. It has been interesting to look through these records, gaining a view of his work and the life of an engine man on the EJ&E through two decades more than half a century ago. I have also used this information to build a roster for my model railroad, using a sampling of locomotives he had operated. A bit of EJ&E geography is useful here to get a perspective on where the trains were going. These are the major points on the railroad although there were several branch lines, especially in the early years. The business of the EJ&E was moving finished steel out and raw materials into the multiple steel mills near Gary, IN, moving coal and freight to online industries, and to a great part interchanging cars between railroads entering Chicago. Based on the 1954 EJ&E Employee Time Table #11, in the 73 miles from Joliet to Waukegan there were interchanges with twelve railroads, plus an additional five interchanges in Joliet itself. By having the EJ&E route cars around Chicago, the other railroads could save time and deliver goods more quickly. Let’s take a look at a page from one of the log books from the first two weeks of September 1948. There are several interesting things to note. The EJ&E was about to complete the transition from steam to diesel locomotives in 1949, and in fact there is only one entry in this two week period for a steam locomotive. September 9, 1948 was to be my grandfather’s last day to operate steam. Engine #724, recorded under the Engine No. column, was to be his last trip on a coal burner. See the picture of sister engine #727 at the top of this post – a magnificent machine – photo from Bill Gustason collection – EJ&E Archives. He made no mention of the significance of it that day, nor in any of his following time logs. The #106, 119, 118, and 116 locomotives are the big Baldwin DT-6-6-2000 center-cabs which were delivered just a few months earlier in 1948. The image on the home page of this blog is one of the Baldwins. The engines 410 and 411 were NW2 diesel switchers. Although the EJ&E had regularly scheduled trains, all of the road trips during this two week period were extras as indicated in the Class of Service column. And they were all back and forth between Joliet (Station 30) and Kirk Yard in Gary, IN (Station 143). Then there were the two trips in a day on September 11. One starting at 4am and another train the same direction at 10:30pm. There is a comment about “back lap Matteson to Park Forest” that I do not understand fully. In the far right column is the name of the crew, which I assume to be the fireman. In the “it’s a small world category” one of the members of our model railroad club mentioned to me, after I wrote a piece about the EJ&E in the club newsletter, that his grandfather worked for the EJ&E in the 30’s and 40’s. Sure enough, I found several log book entries where his grandfather and mine had shared the cab. Wanting to get a profile of his work I did a survey of the log books, selecting the first six months of 1943 and the same period for 1953. Entering the records into a spreadsheet I was able to tally the number of trips on specific engines and to specific locations. Transition to diesel power from steam on the EJ&E was completed in 1949 so the first period was predominantly steam and the second period was all diesel. As expected in 1943, the Mikados were not switching in the yards, and the 0-8-0 did not run the through freights. Likewise in 1953, the big Baldwin center-cabs generally were assigned to the road freights. 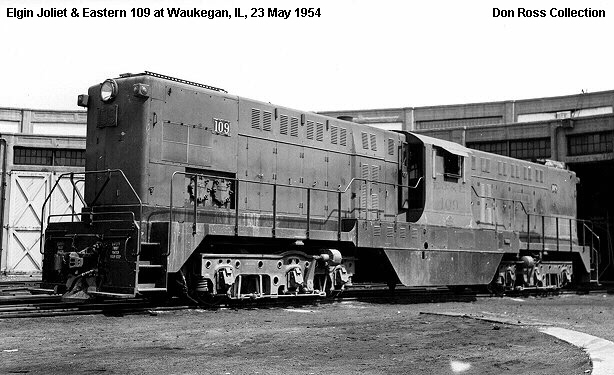 However, there were several instances of NW2 switcher consists running road trains between Joliet and Waukegan. Here is a second view of a log book, this one from May of 1944. Traffic was very high due to the war and there was usually just one day off per week. The engines noted in the log book were all steam in this two week period, although diesels were common in the yards by 1944. The 300 and 500 series were 0-8-0 switchers, and the 700 were 2-8-2 Mikados. The last entry #114 was an old 0-6-0 Alco-Cooke due to be scrapped in 1945. I build my modeled locomotive roster from these logbook entries, to represent what my grandfather would have operated, bringing back a bit of history and some conversations with him I was never to have. He passed away when I was ten years old, so I am grateful that these memories in the form of time logs, have been passed down to me. Photo – Accurail kit assembled and upgraded with Kadee couplers and metal wheels. There seems to be a fear of kits today among model railroaders. With fast food, streaming video and music, and next day shipping from anywhere within 4,000 miles it seems that the days of assembling models from kits are slipping away. Either people want things “now”, or they are hesitant to open a box and assemble their own model from parts. I can’t help you with the “now” factor, but I can help nudge you toward a very enjoyable part of the hobby, building your own rolling stock. Why take the time to build your own? Limited selection of ready to run (RTR) rolling stock is one reason. Yes, there is a lot of rolling stock out there in plastic blister packs, but are they really the ones you want? I admit that I do buy good quality RTR cars when a highly desirable model comes out. But then look at the prices! These days $35 is a good deal for a well detailed RTR model. Enjoyment of the building process is the third reason. Putting together a fine model is an excellent way to spend an evening or several evenings. I will not delve into the history of kits here but the old Ambroid kits with wooden parts were replaced by the Athearn “Blue Box” kits in the 70s and 80s and those have now been replaced by the more detailed kits by Accurail and Bowser which sell for under $20. A good entry point for someone starting in kits would be an Accurail box car. There are usually less than 20 parts and the model can be finished in a couple of hours of relaxed work. Here is a picture of an Accurail 8500 series refrigerated car. This car has separate ends due to the color differences, but most Accurail kits have the ends molded on, even easier. Instructions are clearly worded and logical. These kits are made in Illinois, not over-seas. The brake gear has a good level of detail, including rods and levers, but is not overly complicated to install. Ladders and grab irons are molded to the car but are a slim profile casting and look good on the layout. Lightly weathered these make great looking cars. The company also has many of the cars available unpainted if you would like to do some customizing of paint and decals. Figure 1. Accurail kit with instructions. After building a train of Accurail cars you may be wanting something a bit more challenging and detailed. You can step up to a Red Caboose kit. Here the ladders and grab irons and stirrups are separate molded parts which are glued onto the model body. The part count goes up and the parts get smaller and more delicate. You can see the upper right sprue set in Figure 2 has brake levers and rods – these get glued to the bottom of the car after the frame – the lower right sprue set – gets glued on. Notice also that there are two pairs of doors on the second sprue set from top right so that you can select the one which best models your era. These make great looking models, but not something for the kids to handle. Once you are accustomed to the Accurail kits, two evenings should have one of these fine kits on your layout. Figure 2. Red Caboose kit and instructions. More detailed parts and more of them. A two evening project. Now that you have added a few Red Caboose cars to your fleet, perhaps you are looking for a unique prototype from the 30s, 40s, or 50s and are willing to put some work into it, including painting and decaling. A Tichy kit may be just the thing. Made in North Carolina by the same company that makes a large line of window and door castings, these cars require drilling for grab irons and careful assembly but make wonderful models. They make several box car models, a tank car, coal hopper, and flat cars. Notice the sprue to the upper left of the box car body has two sets of end panels so that you can better match your prototype. The large steel nuts in the top center? Car weights. There are hexagonal moldings on the inside of the car floor to accept these and a dab of silicone or canopy glue holds them in place. Figure 3. A Tichy kit, nicely detailed and a waiting challenge. There is a second side to the instructions. If you want to get your feet wet in kit building I would suggest an Accurail box car, or a Bowser hopper. I have no interest of connection in any of these companies – I just have a cabinet full of kits. Use liquid solvent cement for styrene, not the “model airplane glue” in a tube. Apply with a very small paint brush or with a micro-brush, the ones that look like a little fluff ball on a stick hobby shops and craft stores sell them. Take care not to let cement get between your fingers and the parts you are holding – you will leave a “personal touch” on your model that will not be prototypical. Use a sharp Exacto #11 blade or sprue nippers to remove parts from the sprues. Work on a light background with good light, good ventilation, relax and take your time. Be proud of your work. It’s called “modeling” after all.